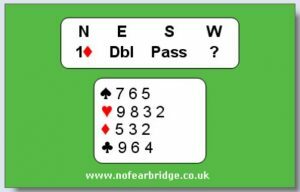 Already play bridge but would like to improve your game so you can play better bridge at your local club, or even just with your friends? Taking bridge classes and would like the chance to practice and improve between sessions? 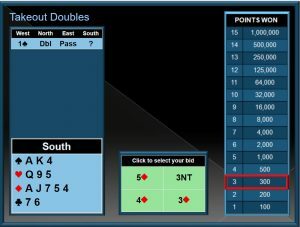 Being able to log in online at any time and practice your bridge bidding in between your classes or club sessions. Playing a hand and immediately receiving feedback on how you played and how you could improve your playing. Being able to access to hundreds of flashcards on a wide range of topics, or many interactive tutorials that could take you from being a mediocre player to a better player. Well, stop imagining because all these things are possible! Everyday thousands of people just like you are learning to improve their bridge playing on the Internet using interactive learning activities. It doesn’t matter if you’re a complete beginner, an improver or even an advanced player, you too can learn to improve your bridge playing online. You will very quickly learn how to become a better bridge player. OK. Where can I learn how to play bridge online? 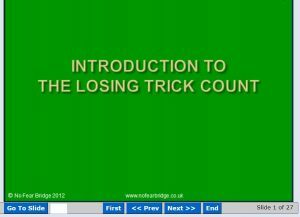 It is the number 1 site for anyone wanting to learn how to play bridge online. You can take a no obligation, two week free trial. No need to give your credit card details unless or until you decide to continue. No need to give your personal details unless or until you decide to continue. 2. No Fear Bridge is run by Leigh Harding. A highly experienced bridge class teacher. Once you’ve tried her interactive site with its activities, progress chart, quizzes, tutorials, flashcards and more, you’ll be hooked! 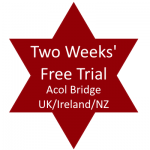 There really is No Obligation and you can start learning or improving your Acol bridge bidding and play immediately. Try the interactive activities, see if you can get your username featured on the weekly quiz leaderboard. You can learn or improve your bridge skills in a fun and easy'way. You have your own progress chart so you can monitor your progress in the quizzes. Each day there are three different hands of the day. A level 1 or 2 hand for beginning bridge players. A level 3 hand for improving players. An advancer's hand - go on, challenge yourself! Many of the hands now feature audio feedback to help you understand the best way to play the hand. 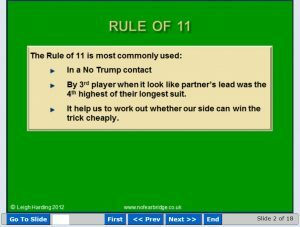 At No Fear Bridge, not only is there bidding practice, you’ll also find tutorials that you can watch on each aspect of playing bridge, including the all important skill of defending. You can take quizzes and work through personalised sets of flashcards to help you become a better bridge player in no time at all. 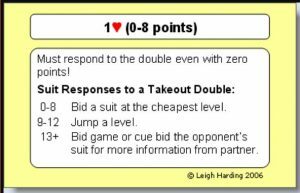 Astounding your fellow bridge players at home or at your club or class. If you already play at your local club you will quickly learn how to play better duplicate bridge. Your bridge playing strategy will improve, guided by the thousands of lessons, hands outs and videos. Bridge Playing With No Fear Bridge? Let me expand a little more on exactly what you can do to significantly improve your Bridge playing at No Fear Bridge. What is it and when should you use it? Just one of the tutorials grouped by level from Level 0 for complete beginners, to level 3 for advancers. All designed to help you understand aspects of bridge including conventions. What is it? How and when should you use it? Improve your understanding of No Trump Rebids. Learn about this convention and what it can tell you about your partner’s hand. Grouped by topic, Flash cards are a fast, fun and easy way to learn. click on the card to reveal the answer. You get over 200 cards to work through and can even create your own personal set to help eliminate the weaknesses that are holding your game back. Simply remove the cards you already know! Take a No Fear Bridge two week trial and get access to all the ‘Basic Bidding Flash Cards’ and the ‘Overcalling Flash Cards’ plus additional topics such as Weak Twos, Transfers, Stayman, Responders 2nd bid and 4th suit forcing. You will quickly learn bridge playing strategy. Do you know how to decide which card to lead with? Don’t worry, with over 400 hand for you to practice with, you’ll soon master it. If you select an incorrect or inferior lead you will receive instant feedback. No Fear Bridge Is All About You Learning How To Become A Better Bridge Player By Focusing On The Exact Skills You Need To Improve. Monitoring Your Progress Will Help You Learner Faster and More Easily. If you find after two weeks that you have not improved you simply end your trial membership without any further commitment. No credit card or other personal details are required for the trial. Just a valid email address to receive your password.